This is only half-way true here, as the Lydian Quartet is an American string quartet, established in 1980 and artists-in-residence on the faculty of Brandeis University. 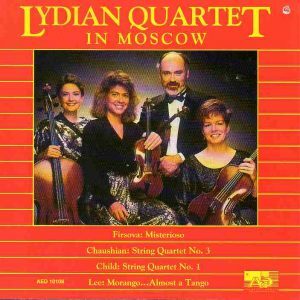 There is no indication given on this CD as to why it is titled “The Lydian Quartet in Moscow”. Only two of the featured composers are from (now former) Soviet Union – and one of them, Levon Chaushian, is Armenian. Peter Child was born in England in 1953 and has lived in the US since 1973, and Thomas Oboe Lee is an American composer of Chinese origin, born in 1945. So presumably Moscow is where the recording was made (no information about location or date are given). So it is rather a case of West meets East – and it afforded an opportunity to make interesting discoveries. It was the first time I believe that the music of Elena Firsova was represented on CD, at least in the West, and it brought to western public awareness, alongside with Sofia Gubaidulina who’d been increasingly well documented, and before the older Galina Ustvolskaya whose re-discovery was still a few years ahead, another strikingly original female Russian (or should I say Soviet) composer’s voice. Born in 1950 in St-Petersburg (and married with the composer Dmitri Smirnov), she was trained there and in Moscow, but most influential was her encounter with composer Edison Denisov and with Philip Herschkowitz, a pupil of Anton Webern. Her short (10′) 3rd Quartet “Misterioso”, composed in the memory of Stravinsky in 1980, is a lament written mostly in hushed, subtle and haunting sonorities, with high-pitched violin melismata akin to bird cries or sobs, and a few more violent outbursts. It seems to depart from where Shostakovitch’s last quartets arrived and, in its stark simplicity, it is reminiscent of another masterpiece inscribed to the memory of Stravinsky: Schnittke’s Canon. Firsova’s Fourth String Quartet, “Amoroso”, from 1989, was also recorded, by the Chilingirian String Quartet, together with the Second SQ of her husband Dmitri Smirnov, “Stravinsky, Schittke, Roslavets, Smirnov, Firsova – Chilingirian String Quartet”. I am not aware of any other recordings of the music of Levon Chaushian (born 1946), but on the face of his 3rd quartet he deserves to be better represented. It is written much in the same mood as Firsova’s quartet, starting with high-pitched violin harmonics and hushed melismata, giving way to a more agitated passage favoring the ensemble’s upper registers. The second movement is a slow moving (and moving – pun intended) dirge with moments of dance-like acceleration, sometimes evocative of the kind of crossover world music that has become a trademark of the Kronos Quartet. The finale is a wild dance reminiscent of some Shostakovich finales (like that of his piano trio), with moments of mysterious repose. I would indeed suggest that what makes the compositions of these late Soviet composers so original and interesting is that they were trained away from the Western, post-webernian traditions and strictures, and therefore used the parameters of music-making in a more free and personal fashion. No so with Peter Child. His quartet displays fine contrapuntal science and passionate and fiery expression but couched in a stark and thorny language, reminiscent of Berg’s Lyric Suite but without Berg’s sensuousness. The last movement, in form of a short epilogue inspired by the final chorales of Bach’s cantatas, is more tonal in an Ivesian sort of way. Thomas Oboe Lee was born in Beijing, China in 1945. He and his family left Communist China in 1949 and lived in Hong Kong for ten years until 1959 when he moved to Brazil, before emigrating to the US in 1966. He has a prolific output of 120 opuses, though his 6 and ½ minute “Morango… Almost a Tango” (1983) is his only big hit piece. It starts as a slow moving dirge-like tango and soon evolves into more animated, sinuous, dance-like and nostalgic melodic lines, before ending in the same mood as its begining. It sounds again like the kind of music the Kronos Quartet would commission and perform – and actually, they did, and you can find it on their 1987 album “White Man Sleeps” on Elektra Nonesuch. The notes are informative enough on the performers’ and composer’s biographies and provide analyses of the quartets of the two western composers’, but other than date of composition, they are unfortunately silent on the Soviet works. With 48 minutes the CD’s timing is short. 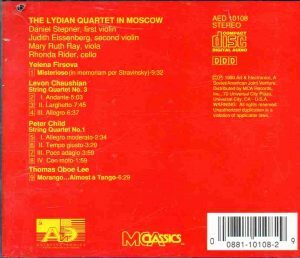 You can hear excerpts on the Lydian Quartet’s website.